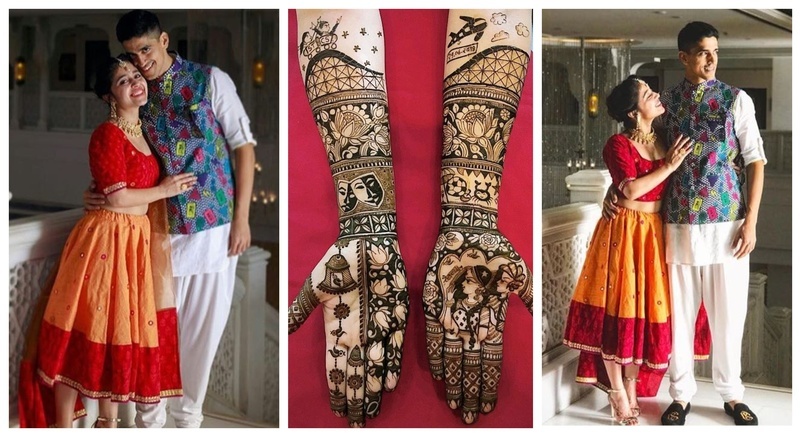 Shweta Tripathi, the bubbly actress from 'Masaan' is engaged & her mehndi design is ruling the internet! What started out as a mid-air conversation five years ago is now culminating into a wedding for ‘Masaan’ and ‘Haraamkhor’ actress Shweta Tripathi and actor-rapper, Chaitanya Sharma aka SlowCheeta! How cute is her peter-pan dress from Silayi? Here’s the bride-to-be explaining her mehendi design by Jyoti Chheda, “There are elements from our wedding invite too. There’s a crab, as I am Cancerian, there’s a football as it’s his first love, apparently. Then there’s an umbrella, champagne glasses, sunglasses a starfish and bride and groom figurines. I love lotuses, birds and fish, so they are also in my mehendi in abundance, all over!”. Over the weekend, a bachelorette party was hosted for Shweta by her friends, which was gatecrashed by Chaitanya. He shared a picture from the party and wrote: "This cutie is proof that someone up there loves me a lot. Can't believe I'm getting to marry this ball of happiness! Mr and Mrs Sharma- Coming soon." Also, here’s how the groom-to-be proposed to his beloved. In the words from his now fiance, as she said in a recent interview, “He proposed at a place called Cuckoo Club, which is a performing place in Mumbai. He wanted to do it on stage because that's how we met -- for a play. He had told me he has a new play, so I went to see that... But it was the proposal,". Shweta Tripathi and Chaitanya met in Delhi while they were filming in for two actors in a play. They later met on the flight back to Mumbai and fell in love. Shweta and Chaitanya dated for almost five years after which the rapper proposed to her, again on a stage. Shweta Tripathi will be soon seen in a web-series, titled Mirzapur, and in a film (Cargo) in 2018 while Chaitanya Sharma will be seen in Zoya Akhtar's Gully Boy, co-starring Ranveer Singh and Alia Bhatt. Well well, can’t really wait for their wedding pictures!